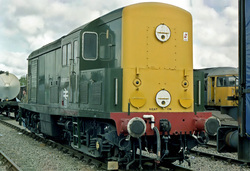 A short lived class introduced at the start of modernisation in 1957.A total of 44 were built.They only lasted until 1971 in frontline service.Four however were converted into Train pre-heat Units and lasted a further 11 years.D8233 is the only survivor and is currently under restoration back to operational condition. This is ADB968000 (formally D8243) that was used as a Coaching Stock pre-heating unit.I think at this time was based at Bristol.It was finally scrapped at Vic Berry's in Feb-1991 becoming the last member of its class to be cut up. Here it is seen on display at the Westbury Open Day along with many other locomotives.This was held as part of the GWR-150 Celebrations but after BR (with immaculate timing) announced the closure of Swindon-Works it all kinda went flat.The Main Swindon Exhibition was cancelled as the staff basically said 'F*@?k' to it all and refused to co-operate with the management!